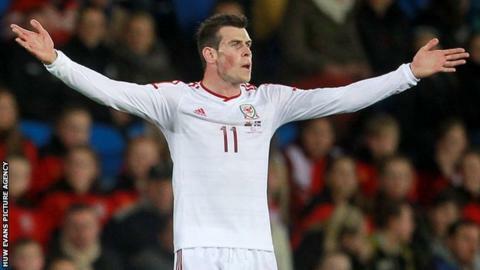 Manager Chris Coleman says he expects Gareth Bale to be available for Wales' friendly against Holland in June. Bale, 24, is set to play in the Champions League final for Real Madrid just 11 days before the game on 4 June at the Amsterdam Arena. But Coleman insists if Bale is fit, he will feature against Louis van Gaal's World Cup-bound side. "Any game we're involved with we need to have our strongest available," he said. Bale was part of the Real Madrid side which won 4-0 to complete a 5-0 aggregate victory over Bayern Munich to reach the Champions League final in Lisbon on 24 May. Wales' friendly against the Dutch will be their final warm-up match ahead of the Euro 2016 qualifiers which begin in September. Coleman's side are unbeaten in their last four games and the manager is keen to have a strong squad available for the game in Amsterdam. "We've got to get momentum and keep winning games and to do that we need to always be looking to field our strongest," Coleman added. "If any of our players have got an injury doubt then we never take the risk - sometimes that comes from fatigue. "Otherwise we're looking to go with our best and our strongest to go to Amsterdam to get a result." Coleman, who was speaking at the official launch of the Football Association of Wales' bid to host games at Euro 2020, believes Wales have a good chance of qualifying for Euro 2016. Wales will face Bosnia-Hercegovina, Belgium, Israel, Cyprus and Andorra in qualifying group B. The top two teams in each of the nine groups will progress to the tournament finals, along with the best third-placed finisher. The remaining eight third-placed teams go into the play-offs in November 2015 and Coleman is confident Wales can be among the 24 teams at the finals in France. "I believe we'll do it this time," said Coleman, who succeeded the late Gary Speed as Wales manager in January 2012. "I don't say that flippantly. We're in a tough group but I think we've got a good bunch of players. "We've got the nucleus of a very good team but it's having them together more. "We just need them together more often and if we do that and they're playing at their maximum, I think we'll have a real successful campaign. "Once you've qualified once, I think that momentum will carry us on and we'll do it again."